Per its World Trade Organization (WTO) accession agreement, China reduced its Most Favored Nation (MFN) tariff on fresh table grapes to 13% on January 1, 2004. This is the rate applied on grapes imported from the U.S.
On April 2, 2018, China implemented an additional 15% tariff on U.S. table grape imports. This action served as a retaliation against the U.S. implementing additional tariffs on certain foreign imports, including steel and aluminum imports from China. A 13% Value-Added Tax (VAT) is applied on all agricultural imports based on duty paid value. The Bureau of Reclamation recently increased the water allocation for south-of-delta users from 40 percent to 45 percent. Any additional water in the Central Valley is welcome, and a 45 percent allocation is surely better than the zero allocation we were receiving not long ago. This increase comes amid another positive development, which is that most Valley water agencies and ag groups are now speaking with one voice and have ended the circular firing squad that, for a long time, held back Valley efforts to get more water. Still, there is a lot more work to do. The Valley should be getting a 100 percent allocation. Environmental regulations that result in billions of gallons of water being flushed into the ocean, the operation of the pumps at less than capacity, and the lack of adequate storage are crucial problems that diminish our water security. The House of Representatives has passed numerous bills to solve these problems, all of which have been killed by Democratic opposition in the Senate. So long as Senate Democrats refuse to provide Valley communities the full allocation we're entitled to, our fight for water will continue. After a slight delay, the table grape season in Coachella is finally ready to begin. 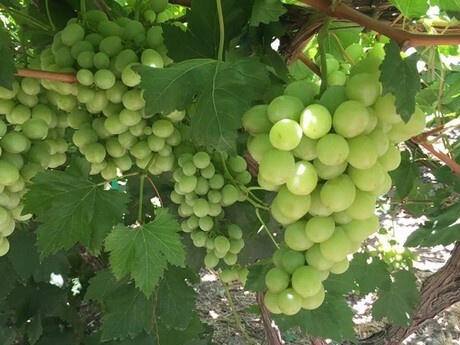 Sporadic weather is to blame for the delayed start, with growers mentioning that the frequent changes in conditions have somewhat confused the vines. As a result, portions of the crop are lighter than others, while overall fruit sizing is smaller than usual. It also means that early grape volumes will be lighter. "This year's Coachella season is a little bit later than normal," said Rob Spinelli. "We are expected to start early next week with our conventional Sugarone greens and red flames. Some growers have already started but we're seeing a lot of smaller sized fruit than normal. Because of the sporadic weather, the fruit set is also varied in different spots, with some more advanced than others. Early season grapes look to be lighter in volume, but as we get to our later vineyards in Coachella, it looks to be a more normal yield." The later start is set to benefit growers, as it will present a chance to clear out any remaining stock from Chile. This pattern is also set to continue throughout the California season, with each region predicted to start a little later than usual. "This will help clear out some of the Chilean crimsons, meaning that we won't be overloaded with stock once volume increases in California," Spinelli observed. "Therefore, we expect to have a smooth transition. The front end of the Mexico deal has also been light and we expect demand, particularly for greens, will be strong." "Organic reds will start up at the end of next week, followed by greens and blacks during the week of May 21," he added. "It looks like the San Joaquin Valley will also be starting later than it has in the last five years, towards the end of June or early July. This can also be attributed to the hot and cold weather during the past few months. A start date at the end of June or early July is actually closer to the long term average for this region." Anthony Vineyards will be launching a few new varieties this season. The IFG varieties will appear later in the season and will stretch for the bulk of the California season. According to Spinelli, these grape varieties have a sweeter flavor profile, quite distinct from traditional varieties. "Starting July, Anthony Vineyards will see some of the new IFG varieties beginning," he shared. "This includes the Candy Dream and Funny Fingers. Both are black varieties, with the Funny Fingers being elongated. We also have Candy Hearts which is a red variety harvesting into August. These are very sweet grapes and are a category of their own with a different flavor profile. From early August to the end of October, we will also have the Sweet Sapphire available." Sunriver has a real-time intelligence team that enables us to harvest our fruit at the optimal point of maturity, which matches the fruit to our customers' needs and guarantees a better product for our customers. We combine this information with our assessment of customer demand to schedule all harvest activities. This allows us to get the best fruit to you when you need it – fresh off the tree or vine. With our diverse portfolio of land throughout California, as well as our dynamic harvesting labor force, we often find areas to pick fruit when others cannot due to poor weather. Once the harvest schedule is determined, our citrus and vine products are handpicked and placed in containers for transport to one of our packing facilities.